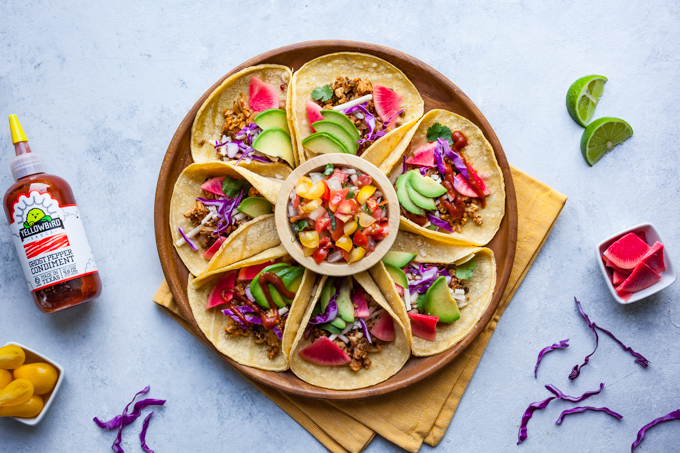 Healthy, flavorful vegan tacos! Smoky tempeh + lentil tacos that are ready in just 20 minutes. This is my first official post of 2019 and I’m pleased to say that it falls in line with two of my main intentions for the year- to eat more tacos and more pink food! I have a few other important intentions- more play time with my daughter and less screen time. I’d love to hear some of yours in the comments! I’m so relieved the wait is almost over! Also completely excited, exhilarated, terrified, and uncertain! I’m guessing these are all normal feelings for someone in my situation. I took a major gamble switching careers from tv production to become a food blogger. I essentially traded financial security for a more soul-fulfilling path and time will tell (in the next few months) if that risk will pay off. I certainly hope it does! If you enjoy my recipes and you’d like to support my small business, I invite you to pre-order a copy of my cookbook! As a gift to everyone who pre-orders, I created a bonus ebook of 20 Minute Vegan Lunches that you can claim by emailing a screenshot of order confirmation to bonus@carrotsandflowers.com. Now on to the good stuff- these incredibly delicious and EASY Vegan Smoky Tempeh + Lentil Tacos! The smoky tempeh + lentil taco ‘meat’ is made with this my new favorite sauce- Yellow Bird Ghost Pepper Condiment! It’s much thicker than a traditional hot sauce, which I love. I’m all about hot sauce but I don’t want to water down my food. This thick, spicy, smoky condiment adds so much flavor to anything it touches- without creating a liquid-y mess. I call that a win! Another thing I love about the sauce (and the entire line of Yellow Bird sauces) is that they’re made with wholesome ingredients- including fresh vegetables and spices. There is no added sugar or any preservatives- unlike most bottled hot sauces! The spiciness of the Ghost Pepper Condiment can be balanced with savory and cooling elements like vegan mozzarella and avocado. I added a few quick pickled watermelon radishes for tang and for color. You can find the simple recipe on my Instagram! We love seeing what you come up with! Amazingly flavorful smoky tempeh + lentil tacos that are ready in less than 20 minutes for a super easy, delicious vegan dinner. Heat the oil in a large pan over medium heat. Tilt the pan to coat the surface. Meanwhile, finely dice the onion. Add the onion to the pan then mince the garlic. Stir the onion then add the garlic to the pan. Let it cook while you finely dice the tempeh. Stir the tempeh into the pan. Add the lentils, Ghost Pepper Sauce, ketchup, cumin, paprika, and salt. Stir well to combine. Cook for 4-5 minutes, stirring occasionally. Taste and adjust seasoning if desired. Reduce heat to medium low. Prep your desired toppings. Moisten the tortillas and warm them in the microwave for 30-45 seconds. Put 1-2 tbsp vegan cheese on a tortilla. Cover with 2 tbsp smoky tempeh lentil mixture. Top with pickled radish, chopped avocado, cilantro, salsa, and more Ghost Pepper Sauce if you like it hot! This post was sponsored by Yellow Bird– our new favorite condiment maker! Their products are lovingly crafted in Austin, Texas and the company started with a husband and wife team cooking up sauces in their kitchen- which is a very similar story to how Carrots & Flowers began! We’re so happy to partner with companies who align with our core ideals and I encourage you to try all of their amazing sauces, which can be found online or in grocery stores like Whole Foods! What type of lentils do you use for this recipe and how long do they cook? The 3-grain Tempeh we buy at Trader Joe’s has barley, and hence is not GF. What Tempeh are you using? Alaine, there is a brand called Lightlife (around since 1979) that makes organic tempeh. I buy original flavor. The ingredients are: cultured organic soybeans, water, and organic brown rice. That’s it. I get it at Whole Foods and any other health food store in the area, as I’m in Florida, our Publix stores carry them. I’ve also seen them at some Super Walmarts, Super Targets, etc. Hi, I have a question about a recipe in the cookbook! In the Tempeh No-Tuna melt, it says to add crumbled tempeh. My question is how do you prep the tempeh? Is it uncooked and unseasoned? Won’t it be bitter or taste weird? Great question! Tempeh and tofu are sold fully cooked actually! They can both be eaten straight from the package. Cooking usually just changes the texture, which isn’t necessary for this recipe. The crumbed tempeh is perfect for No-Tuna melts! The dressing adds plenty of flavor, especially when combined with the cheese. Hope you love it. Thanks for buying a copy of my book! Thank you Megan! I will try the recipe! I’m very happy with your cookbook!